1. There’s something ridiculously cute and wonderful about an angry soft toy! I’d like to turn people I know into soft toys so they can get high pitch voices and squeak while they bounce up and down *kawai*. Not overly enamoured by the art in general, but this is cute and fun enough to make me happy at the moment, I need some fantasy in my life today. It’s a good sign when the first episode makes me giggle the second time I watch it. Last time I watched the first episode I had flu! I want a talking soft toy to come flying through my window *pouts*. 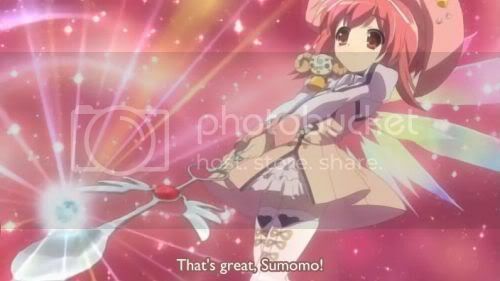 Sumomo’s voice is beginning to grate in my head though…ooo pretty sparkly lights next to the fountain! Aaw this is making me feel all warm and fuzzy! Yay! 2. Meh, not interested in the romantic element, bring back the cute soft toy! Yaaaay. Want to cosplay cute magical girl uniform *uwaaaaa*. That hat is ridiculous! That’s animal molestation, stop rubbing that sheep! hahaha. I like the little chibi bits. Oh no…bored by nostalgic friendship bit, pull yourself together girl! *slaps*, and a song, oh god, I can’t take anymore, aaaargh. Losing interest now ^^; Letter should have read, “Sorry can’t come round tonight, gone to a special party for uber cute talking sheep”. OMG it’s a girl friendship love moment *so cute* eeeeee! This is too slow for me I need some sheep ninja violence. 3. Noone notices a sheep floating around on top of a magic book…hmm. A magical doorway, that magical book ruins an excuse for a perfectly needed explosion! A magical spoon just doesn’t have the same appeal to it as, say, giant carrots…the arch enemy is amusing though, what a snob. Really don’t like the eye art, and I’m all about the eyes, oh well. I want stockings with little pink hearts on, so cute. I like wishing on shooting stars, but I haven’t seen one for 8 years. Why do they draw hair so it appears to be behind the eyes, it really annoys me! Oh no, now it’s turned nauseatingly cute, yet somehow… the warm fuzzy wuzzy happy music and sparkly stars make it ok. Ooo, another enemy, fantastic. 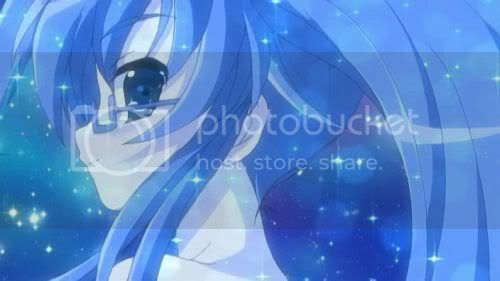 Yuuki Nona is the first character design I’ve actually liked, maybe it’s the long blue hair, or the strong blue eyes. 4. I’m still enjoying the OP music and finding the ED music dull. All themed around water drops…so no surprises at a swimming pool episode, here’s waiting for the beach episode :) Ooo, Yuuki’s gonna steal your man (sheep?! ), what will you do! Yay for love triangles. So, it’s Aspalas and not something quirky like Asparagus, stop talking and fight over the drop you silly girls I’m getting bored. *yawn*. Ooo pretty artwork, like, finally, something I LIKE! 5. As predicted…beach episode, woo! So soon? Was toying with dropping this, but oh, ok, I’ll stick around a bit longer…and was it worth it? 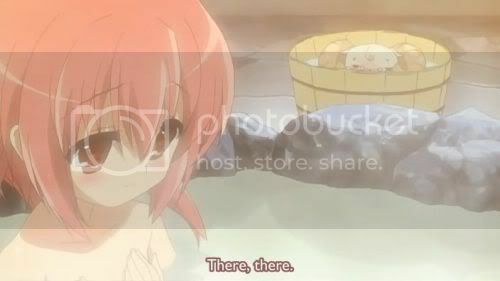 Yes, for the embarrassed sheep watching girls bathing talking about breast size. 6. It’s on in the background while I do other things now, the problem with this is that I don’t like any of the characters’ design or personality enough to care about their relationships, so it’s a big fail for me. If this had focused on the magical rivalry and taken advantage of the soft toy sheep jokes I would have been more engaged. I mean, seriously, they’re gardening again! To top it off the magical bits have never been warm and fuzzy enough to move me, so, a big fail for Nanatsuiro. 7. Why am I still watching this, well I guess I’m too tipsy to move onto and concentrate on Shigurui, and I need something brainless to take my mind off recent events, so, ok, let’s see where this is going, I have a few hours to waste until I fall asleep. Sometimes I love how clueless and innocent guys are in anime. *note to self* turning up the volume during anime doesn’t make it easier to follow the Japanese when you’ve only studied beginners level. Must buy some big speakers I think these headphones are melting my brain. Argh they’re blowing whistles. Oh great, some ‘shoujo-ai undertones’ don’t torture me! Great a secret history! Something to reel me in and keep me watching…yay, forbidden love! 8. There’s something very masochistic about still watching this…they’re using mobile phones but where is the product placement ‘NOKIA’, ergh, I’ve been watching too many American movies recently. Ha, I’m sure his hand is really big *dies*. Don’t teach little girls to kiss sheep that’s just…wrong. 9. Why do cat ears and over enthusiasm make a guy more appealing? Some great music clips, frustrating they weren’t longer or developed. 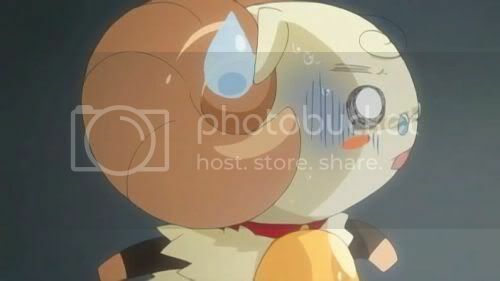 Well at least noone I love has turned into a lifeless stuffed animal *sniffle*. 10. Can I have a cute male-neko-servant for Christmas please? TIME TRAVEL?!?! Well at least I can’t accuse this of being predictable anymore. I want to go back in time and change things :( Argh. 11. He can’t forget their love…noooooooo. “I had this premonition, because everything has been going all too well, that perhaps it’s all just a dream…and that everything will disappear when I open my eyes”. ARGH. This is supposed to be cheering me up! 12. Noone notices girls flying on magic spoons. Hmm. This episode did make me cry a little…and they all live happily ever after. I certainly didn’t need to know Japanese to understand what was going on. Well I won’t be getting the soundtrack, none of the Sumomo figurines I’ve seen look particularly cute, and I don’t think I’ll be revisiting this anime in the future. I’m glad I didn’t drop it at episode 6 for the magical flying in episode 8 and the fight/music in episode 9. 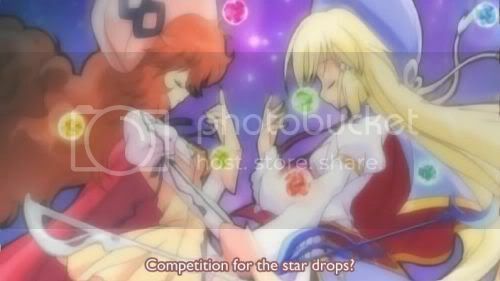 I really wish they’d developed the memory erasing thing when people saw Sumomo catching star drops, and I would have loved it if there were one or two more magical girl characters completing for them. I would only recommended this to die hard fans of magical girl and romance anime.